Think a Challenger looks giant and menacing in America? Here’s one parked in Budapest behind a Suzuki Swift—which you’ll recognize as the Geo Metro. The Swift—ubiquitous in Hungary as it was the first car manufactured in this country—is positively dwarfed by this Mopar monstrosity, seen here in top-of-the-line SRT8 trim, with the 6.1-liter engine and the appropriate Hemi Orange paintjob. The scene is full of little surprises. Like how you could make a whole new set of wheels for the little Suzuki from the material found in one Challanger wheel. Or how it shows that even downtown parking spaces are indeed giant when compared to the average car: it takes 16.5 feet of American muscle to fill one to the brim. 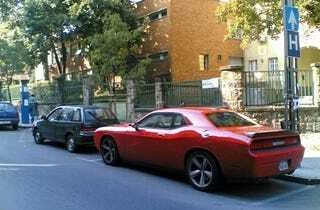 It’s a wonderful sight in Budapest, this Challenger, comically inappropriate, with a punk swagger often missing from city cars. And while we know that the perfect city car is the Mercedes-Benz W140 S600, this come pretty close. All you need now is plenty of Hungarian gasoline. At $6 a gallon. Yeehaw!